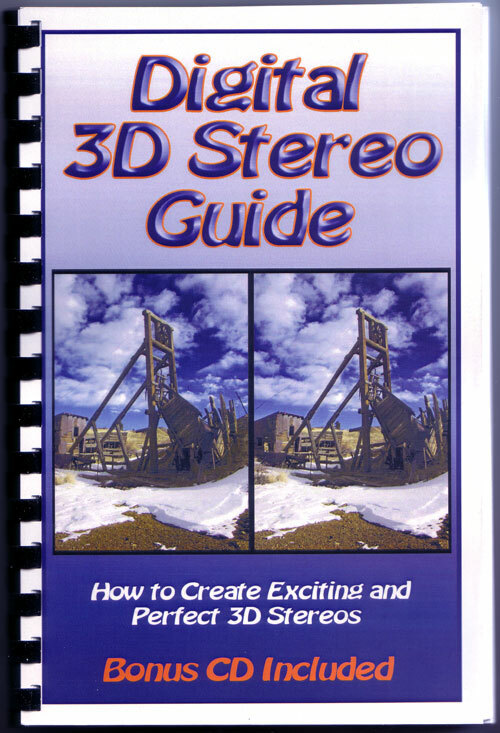 A virtual encyclopedia of digital 3D stereo information. 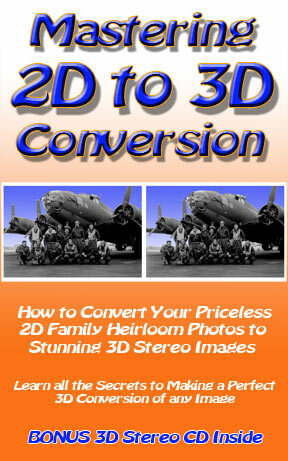 How you can use StereoPhoto Maker, Adobe Photoshop, and other image editors to make impeccable stereos. Every step of the 3D stereo alignment process is covered and explained. Causes and solutions for every type of stereo problem are described in detail . Four powerful methods for converting 2D to 3D are described in detail. You will be doing conversions as soon as you read the first section. From blazing fast depth mapping (displacement mapping) to precise layer shifting, every secret is revealed. Now, anyone who can operate a mouse can convert a 2D image into a 3D . Put some "WOW" in your stereos with these eye-popping, jaw dropping, high impact effects. 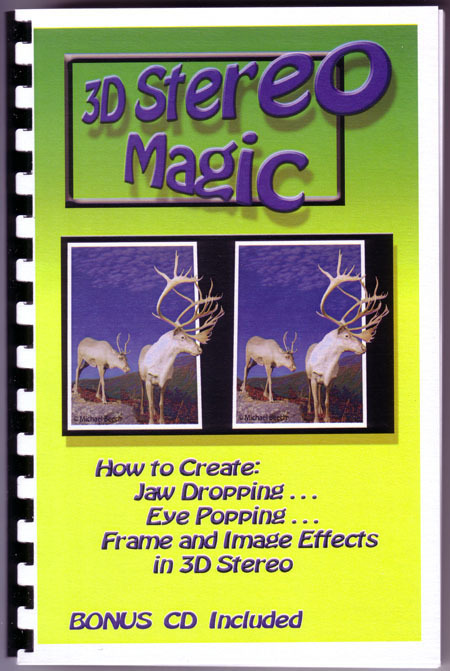 Learn how to warp space, banish window violations, defy perspective, and thumb your nose at stereo window rules. Stereo contests worldwide are being won by persons using the techniques they learned from this manual. The mystery is removed from the creation of every type of frame busting effect. Ways to avoid all WV's, reduce anaglyph ghosting, enhance your images . 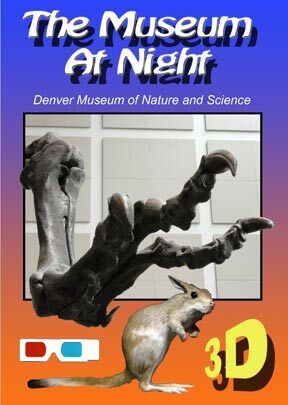 Some people say, “In the museum at night, the animals come out to play.” What do you think? In this wild and wacky CD, the animals come to life and leap off the screen as they escape from their displays. The funny comments the animals make to each other will keep everyone smiling while they learn. After viewing this flip-album of anaglyph images, your family will look at museum displays in an entirely new, fun and exciting way. 3D glasses included. For ages 8 to 80+. PC or Mac. or by making a Paypal payment. Add shipping and handling per the table below. Domestic Shipping: $4.95 for the first book. Add $1 for each additional book. Canadian Shipping: $6.95 for the first book. Add $2 for each additional book. International Shipping: $9.95 for the first book. Add $3 for each additional book. Insurance is optional (an additional $1.70 for up to $50, $2.15 for over $50). I'll be glad to answer any questions - just send a note to dennisgreen@comcast.net and I will get back to you as quickly as I can.